On Friday October 7, 2016, the Center for New York City Law at New York Law School hosted the 137th CityLaw Breakfast. The event speaker was Former Commissioner of the NYPD, William J. Bratton. The event was specially sponsored by Tonio Burgos and Associates. 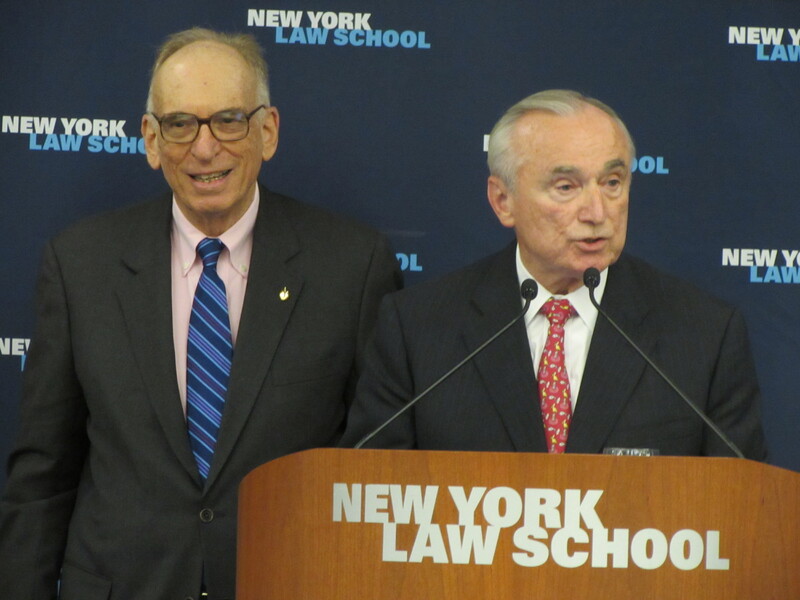 Former Commissioner William J. Bratton was welcomed by Anthony Crowell, President and Dean of New York Law School, and introduced by Ross Sandler, Professor of Law and Director of the Center for New York City Law. He discussed the evolution of policing in America over the past 50 years. Beginning in the 1970s, Commissioner Bratton discussed the new Supreme Court cases which were transforming how the police operated—such as Terry v. Ohio and Miranda. He recalled that at the time police departments were turning away from crime prevention and instead were focused on response. Commissioner Bratton noted that this focus remained until the 1990s when quality of life crime, or “broken windows crime,” became the new focus. He felt that New York City in 1990 was the manifestation of the decline of quality of life in America. He argued that crime and disorder are linked, and one inevitably leads to the other. Further, Commissioner Bratton stressed the importance of community policing and the role that it will be playing at the New York Police Department in the coming years. He emphasized the three Ps of community policing: partnership, problem identification and prevention. Commissioner Bratton also discussed the controversial topic of stop-and-frisk. He compared the practice of policing to the practice of medicine, where too much medicine can have negative repercussions. He acknowledged that at the time stop-and-frisk was ruled unconstitutional, it was because of the large, negative, racially disparate impact it was having on New York City. Commissioner Bratton did note that Terry v. Ohio and stop-and-frisk are misunderstood even today, as evinced by the first presidential debate. Commissioner Bratton finished by taking questions from the crowded room.